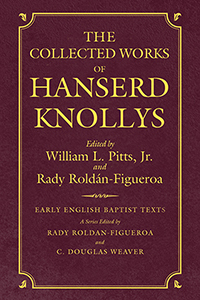 Hanserd Knollys was one of the most influential Baptists of the seventeenth century. University educated, he provided guidance for Baptists on many key issues that formed their identity. In debate with other religious leaders he defended conscious commitment to Christ by each individual, the congregational character of the church, and the necessity of religious liberty. In addition to these three foundational beliefs, Knollys provided guidance for early Baptists on debated issues of practice. He endorsed the value of learning from the writings of inspired women, he endorsed congregational singing, and he supported raising funds for the support of ministers. In all of these matters he provided precedents and strong arguments for Baptist practice. Knollys served as pastor of a local London congregation, extended Baptist influence through preaching tours and provided a high standard of education in the schools he organized and led. Knollys provided long-term leadership for Baptists, signing early confessions of faith (1646, 1688) and participating in an early assembly of Baptist ministers in 1690 and 1691. Knollys was best remembered in the popular Baptist mind as a heroic figure who suffered persecution at the hands of the state through loss of property, extended exiles, and repeated imprisonments. His extensive writings addressed the major issues confronted by Baptists during this first century. By articulating Baptist interpretations he helped shape the denomination as much as any early Baptist writer. This book sets each of his major writings in its original context and thereby illumines early Baptist formations.